Domestic Union Cards™ are picture identification cards that entitle couples to legal status and rights equal to married couples on the basis of a legal affidavit that its holders are common-law spouses. They prove couples’ status as common-law spouses in Israel and abroad. Domestic Union Cards™ provide an egalitarian alternative to orthodox religious marriage. Who Can Get Domestic Union Cards™? New Family issues Domestic Union Cards™ to two adult partners of any gender, religion or nationality that meet the legal definition of common-law spouses in Israel. The couple must live together and share financial responsibilities as a family. They must declare their exclusive commitment and affirm that they do not live with another partner in a legal affidavit signed in front of a New Family’ attorney. The partners are photographed separately and issued their individualpicture ID’s on the spot. 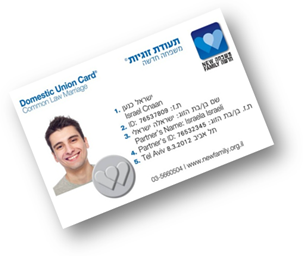 Domestic Union Cards™ are recognized in Israel’s government institutions and many private institutions, including social security, government ministries, municipal governments, health clinics, hospitals, the post office, banks, insurance companies, colleges and universities, health clubs, national parks and recreational facilities. Couples are often referred by government agencies to New Family to get Domestic Union Card’s™ to prove their eligibility for status and rights as a family. Domestic Union Cards™ are recognized internationally as a legal affidavit. Domestic Union Cards™ can be used in foreign countries to prove your status as a couple, for example, if you plan to work or study abroad and need to prove that your spouse should be given a visa or campus housing, or if you want to get visas or status together as a family elsewhere in the world.